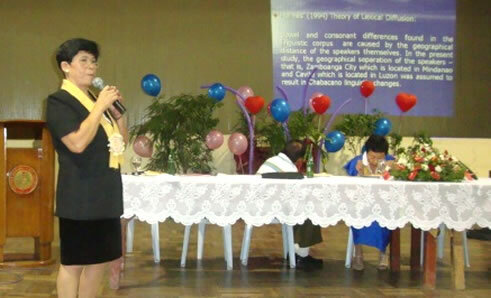 RUPID Director-Dr. Juliet B. Tendero presenting her paper during the Chabacano Language confab. Zamboanga City Government commended the conscious efforts of the Western Mindanao State University-College of Communications and Humanities (CCH) in preserving and promoting the Chabacano Language. Through Resolution No. 755 adopted by the Sangguniang Panglungsod, the local government lauded the college for organizing the recent Conferencia De Lenguaje Chabacano. Dated July 30, the confab bannered the theme, “Lenguaje Chabacano: Fuente para mejoramiento del Comunidad.” The said gathering conducted paper presentations anchoring on the given theme. Considered first of its kind, the innovative event was held at the College of Education’s Social Hall of the university. Among the two papers presented were THE NON-SPANISH IDIOLECT COMPOSITION OF CHAVACANO IN CONTEMPORARY WRITTEN LITERATURE: A CONTENT ANALYSIS presented by CCH Dean, Dr. Estrella P. Olaer and LINGUISTIC VARIATIONS IN CAVITE AND ZAMBOANGA CHABACANO LEXICON of Dr. Bobby M. Cabangon and Dr. Julieta B. Tendero. The latter research was presented by Dr. Julieta B. Tendero, WMSU-Research Utilization Publication and Information Dissemination (RUPID) Director herself. The aforementioned research by Dr. Olaer, is a study designed to explore the Non-Spanish Idiolect Composition of Zamboanga Chavacano in the Contemporary Literature. It also attempted to investigate the lexical borrowings of the said language from contact languages such as Tagalog, Cebuano, and Hiligaynon. On the other hand, the second paper is a qualitative research, mainly aimed to determine the linguistic variations in Zamboanga and Chabacano lexicon in terms of the categories such as: vowel shift, assimilation/dissimilation, broadening/narrowing, and the like. The paper was also presented during the 2010 International Conference on Higher Education Research: Utilization Experience and Discovery at University of the Northern Philippines, Vigan City. In addition, Hon. Vincent Paul A. Elago proposed the adoption of the said resolutionexpressing the city council’s appreciation of the college’s step in elevating the status of the Chabacano Language. Resolution No. 755 was co-sponsored by Hon. Cesar L. Jimenez. The resoultion was passed during the council’s regular session last July 27.